The theory of global warming peaked in 2007 after Katrina and the big Arctic melt. Since then folk began noticing that we had been cooling off, not warming up, and the big events predicted by the alarmists were not happening (big hurricanes, killer tornadoes, rising sea levels, dead polar bears, etc.). Their extreme fear-mongering began to undermine their credibility. ClimateGate delivered a body blow to their diminished credibility when it came out that a small cabal had been tampering with the temperature record and subverting the peer review process. The death blow to the theory is about to be released in a peer-reviewed paper by a former NASA scientist. The study looked for the “hot spot”, an essential feature of the Co2 theory of warming: that in the greenhouse layer of 10 km up we should be seeing more warming over time, creating a hot spot in a time-series map of the atmosphere. This chart from RealClimate shows what it should look like, but very accurate measurements from weather balloons over 60 years do not show it. In the new study, the hot spot could not be found. The warmists have seen this rebuttal coming for a while, and have been arguing that the hot spot is there, just hard to detect, despite the simple truth that the weather balloon can measure well within the accuracy required to detect it. The weather balloons measure to 0.1C while the hot spot should be at least 0.6C. Now the warmists are trying to shift the debate from a hot spot to a cooler stratosphere above. Here is one attempt, relying on “his wife” to justify the science. Come on. Here is another which doesn’t resurrect the hot spot but instead says all its lack does is point to a failure of the models. Huh? The whole theory is based on the models. Every one of them requires the hot spot – it follows directly from the Co2 greenhouse layer argument. Without it, no Co2-based warming. I was initially reluctant to put in these counter examples from the blogosphere since they are so weak, but they show how low the level of discourse has sunk. Even the veneer of science has been dropped. All that is left is mockery of skeptics. We have left the world of science and entered the world of parody. Readers of The Onion would understand. The study also rebuts a second major prediction of the Co2 theory of warming: that Co2 warming is amplified by increased water vapor. Co2 alone cannot fit the climate models, and they all have a plug factor put in for climate sensitivity. The most important physical mechanism for the plug factor is an increase in humidity (water vapor) at the greenhouse layer. Water vapor absorbs more infrared than Co2. The study found that humidity actually was decreasing in the greenhouse layer, negating the effect of Co2. Co2 was always a flimsy reason for warming. It does not correlate very well to the actual temperature record, and by itself is fairly wimpy. A better correlation was discussed in the prior post: inside of a modest warming since the Little Ice Age, climate is largely driven by the 60 year PDO cycle, which is now trending down. The Co2-based warming theory is likely to sink with temperatures as the PDO puts us into a 30-year period of global cooling. This chart from The Hockey Schtick captures the increasing irrelevance of Co2 and the rising pre-eminence of the PDO and solar cycle to explain global climate. Duncan is an advisor to NetService Ventures, where he focuses on digital media and the mobile Internet. Previously he was at four start-ups: Xumii, a mobile social service based on a Social Addressbook; SkyPilot Networks, the performance leader of wireless mesh systems for last-mile access, where he was the founding CEO; Covad Communications (Amex: DVW, $9B market cap at the peak), the leading independent DSL access provider, where he was the founding Chairman; InterTrust Technologies ($9B market cap at the peak), the pioneer in digital rights management technologies, now owned by Sony and Philips, where he was SVP Business Development and the pitchman for the IPO. Before these ventures, Duncan was a partner at Cambridge Venture Partners, an early-stage venture firm, and managing partner of Gemini McKenna, a joint venture between Regis McKenna's marketing firm and Gemini Consulting, the global management consulting arm of Cap Gemini. He serves on the board or is an adviser to Aggregate Knowledge (content discovery), Livescribe (digital pen), AllVoices (citizen journalism), Xumii (mobile social addressbook), Verismo (Internet settop box), and Widevine (DRM for IPTV). Funny how wrong this post is- buts whats tragic is the gross misinformation that it includes. The decade 2000-2009 was the warmest on record- 2010 is likely to be the warmest year on record. Arctic Ice this summer could totally disappear from the arctic. Considering the WSJ is owned by the same individual that owns Fox News the above meaningful drivel is to be expected. What it does however is that it serves to diminish any kind of Journalistic credibility the WSJ once had. "The decade 2000-2009 was the warmest on record- 2010 is likely to be the warmest year on record. Arctic Ice this summer could totally disappear from the arctic. " It's such a shame that you alarmist types feel the need to indulge in fear mongering. I note with interest that you have not provided a link to a credible source to substantiate your wild assertion that the arctic ice could suffer a total meltdown this summer. This comes as no surprise and I'm afraid the latest scientific survey does not support your claim, quite the opposite actually. Rajendra Pachauri head of the IPCC and Royal Society in UK (the UK's national academy of science) have both started backing down and have been forced to issue statements that they respect AGW scepticism. Also, the so called 'scientific consensus' is looking decidedly shaky. You are not very good at spreading alarmist propaganda on CiF forums. Perhaps you should consider taking up another hobby. I don't know what you've been smoking, Peter, but whatever it is, it clearly has erased any hint of honesty in what you have stated. The last decade has seen a steady decline in temperature. Even your high-priest, Dr. Philip Jones of the CRU at East Anglia said, on BBC-TV, that "there has been no statistically significant warming in the last 15 years." Virtually everything that the IPCC has whined about for the last several years has been shown to be absolute nonsense! As for the "2500 scientists" that "signed" a letter… DRIVEL. It was concocted by a handful, sent out as an "opt-out" to many thousands of scientists. To their credit, most did opt out. Those that didn't… well maybe they didn't see the memo…. Pachauri, the IPCC, CRU, UVA, et.al. should be utterly ashamed of the fraud they have been trying to perpetuate. 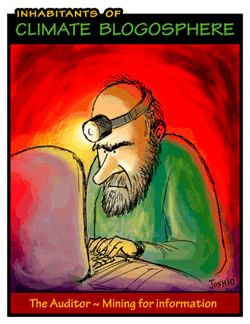 I read all the Climategate e-mails and all the associated documents. Having done so, the record is really pretty clear. The governmental whitewashes in England have ZERO credibility, since they were conducted by those with vested interests in the "green economy" and therefore in the myth of AGW. Best do some serious reading. Start with physicist Dr. John Costella's analysis of the Climategate e-mails, then try CAREFULLY reading the US Department of Energy and the Interior's website. From there, try actually looking at the data. "CO2 in all of geologic history has predicated the earths temperatures and climate." 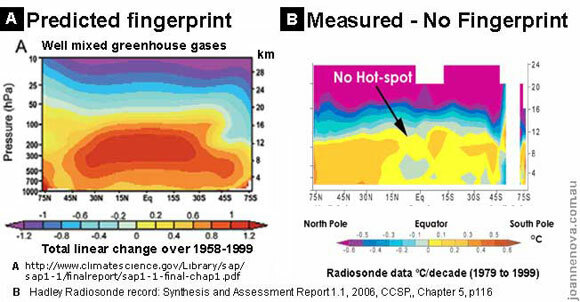 Sorry, do your own data reduction from the ice core data [See http://cdiac.esd.ornl.gov/ftp/trends/co2/vostok.i… and http://cdiac.esd.ornl.gov/ftp/trends/temp/vostok/… then be honest with your results. You'll see that CO2 FOLLOWS temperature, it does not lead it. If it follows, how can it be controlling temperature? The CO2 follows the temperature change by about 800 years. The problem most of us have is with the CO2 story. It isn't doing anything much to the climate yet we are supposed to stop burning stuff to reduce an already tiny trace gas , 0.038% of our atmosphere. The global dislocation of doing so is immense and yet we are supposed to "believe" in CAGW caused through CO2 on the grounds that " we can't find anything else". Have you every tried to explain Darwin to a Creationist? It's a religous debate not a scientific one. Their belief system is dying. Peter S. Mizla , you are quite mistaken with your claims. The two main reasons for this decade being "warmest on record" is the reduction of rural temperature stations used to measure temperature data and the increasing UHI (Urban Heat Island) effect on the reduced station count. And it is proven by various studies that CO2 lags temperature, not the other way around. Your last paragraph is just a lame attempt at a straw man argument that holds no relevance in climate science. This article does a great job of busting the main myth propagated by the United Nations' IPCC. You’re two main reasons are in themselves just more parroting of denialism, which misrepresents any researched and credibly published science. The reduction of rural stations has not affected the temperature record. Secondly, history has shown us that CO2 in the atmosphere amplifies the original warming. That’s the positive feedback. Because it lags doesn’t disprove the natural forcing of CO2 towards a warming climate, rather it reinforces the known relationship. Well, D Bonson, how about the inclusion of totally fictitious data sets from non-existent weather stations in China? How about the placement of weather stations in urban areas, next to parking lots and heat vents? How about the doctoring of data to weight those readings just mentioned to make them comply with totally faulty computer models? NASA's GISS data has been shown to be totally bogus. Just like CRU data, it has been so "massaged" as to be pretty much meaningless. Go do some reading.. Citing "Jones et. al 2008" is like citing the ENRON executives as sources of valid financial data. 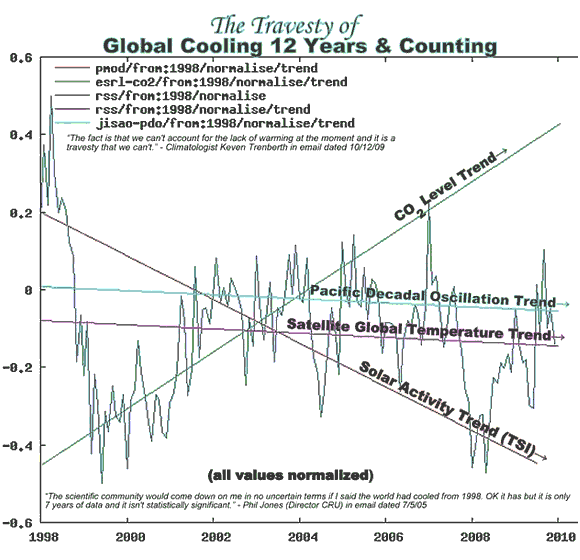 The "natural forcing of CO2 towards a warming climate" is based on … exactly what? We are talking about a gas that comprises 0.039% of the Earth's atmosphere here. Of the total "greenhouse gas effect", itself a very, very questionable thing, CO2 comprises just 0.0117% (US DOE website). Quite frankly, the claims being made for it by the IPCC, CRU and you are patently ludicrous. Then we have the absolutely scandalous manipulation of the peer-review process in virtually all the published "climate science". "Climate science" is, at this point, about as believable as Bernie Madoff. Nowhere do you give any links to any GENUINELY peer-reviewed data. Do you have any? You are saying that CO2 causes global warming by increasing after the temperature increases! Calm down fella, and start thinking. Interesting that California wants to mandate IR blocking glass to KEEP CARS COOL INSIDE. That's the greenhouse effect for you, if anyone actually measures it: Adding an IR barrier COOLS the car, rather than warming it. One more clue for the clueless. You do the math. The theory of AGW is that radiation from the sun heats the surface which in turn radiates IR which is absorbed by the greenhouse gases. The heat is coming from inside the car, so to speak, not outside. I think that CAGW theory is junk science, a feeble pretext for a comprehensive power grab. But it is vital to counter the bad arguments of the warmthers with better arguments, not worse ones. This (red herring) argument just shows how people are clueless about science. It is funny how non-specialists are trying to debate those that have decades of experience in their own field or try to get in the way of specialist debate in publications. IR blocking is good. It it isolates cool areas from hot areas (car is cold in the summer where weather is hot, and opposite in winter), just like house thermal isolation does. The result is that less fuel can be used to adjust temperature. While for winter waste heat can be used, it still needs to be pumped which reduces car efficiency. In the past the Earth was covered with ice, right into the 30s in Latitude. It has happened several times to varying degrees. The sun has the biggest influence on the planet's temperature. But during these 'snowball' earth phases the planet was a giant mirror which dramatically reduced the sun's ability to heat the planet. This was a tough situation because, left unchecked, a snowball Earth would never have evolved humans. So what changed those conditions, giving us the chance to be here today? Who was our buddy way back when? It was the volcanoes. They continued to spew out all kinds of things including CO2 for many 10s of thousands of years increasing the CO2 content of the world to 1000s of ppm. There was no place for the CO2 to go … land was covered with ice and ice covered cold oceans absorb CO2 but at greatly reduced rates. They could not match the rate of volcanoes over time. So it turns out that CO2 was our real buddy back then. Its concentration eventually reached a level where the atmosphere retained enough heat to re-hydrate and start the melting process. The change in humidity is about 4% for every change of 1 degree F.
CO2 was our buddy back then. I'm not too sure whether CO2 is our buddy today. The last time the planet had CO2 at levels like today, it was about 8 degrees F hotter with 32% more humidity. Cute story, co2hound…. Got any actual data to back it up? How about some GENUINELY peer-reviewed data? If so, I would dearly love to look at it. Your own writings do, however, give us an interesting point….. "1000s of ppm", versus today's paltry levels (391 ppm). I'd say we have a rather long way to go, wouldn't you? The story is correct… The earth was completely frozen between 600 and 720 million years ago.. If you find it, look for an episode of the BBCs Horizon programme called "Snowball Earth"
They tell you how it happened, what evidence they have that it DID happen and how they THEORISE that the world warmed up again… The theory of recovery, however, is NOT based on CO2 creating a feedback and warming the globe. 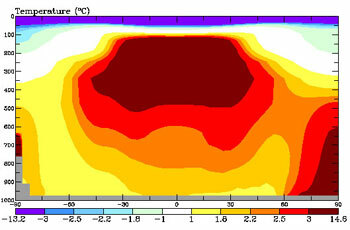 The scientists in the programme came to the conclusion that it was the massive amounts of airbourne sulphur dioxide and sulphurous soot covering the ice, all spewed from volcanos, which eventually allowed the globe to warm (they did actually mention CO2 but disregard it as not a powerful enough greenhouse gas to have been responsible). Another theory floating around is that the snowball scenario was caused by the solar system passing through an area of galactic debris, causing solar diming, and when we came out the other side, the world warmed accordingly. From the first post, CO2 is always going to be our buddy. It acts as fertiliser for every plant, tree, bush, etc. on this planet; The higher the concentration, the better the plants grow. Ask your local plant nursey what gas they pump into their greenhouses. For all that you can expect a tiny amount of warming because of it's concentration doubling. Of course the science offered on the BBC program may not be the most recent on the topic. Caution, this presenter is very high bandwidth! It is a talk given at the American Geophysical Union by Dr. Richard Alley. Here's another example of CO2 being a temperature regulator from earth's history. There is one event, I'm sure you are aware of, the PETM (about 55 million years ago) when the spike in CO2 from natural sources was similar to the spike in CO2 we are seeing today. The CO2 went directly into the oceans causing them to acidify and the land temperatures increased rapidly. Bottom line, 95% of the species on the world died. The oceans are 30% acidic over baselines right now and this number is growing. This event gets as close to the rapidity of the CO2 increase in our atmosphere today as the natural world can get. It's happening faster today, about 10 times faster. And we are the new volcanoes on the planet. We release about 100 times as much CO2 into the atmosphere as all the current volcanoes combined. So in the past things happened much slower because natural forces work on their own time. Today we are making things happen much faster. We are committed to 2 C warming right now because we have about 450 ppm equivalent CO2 in the atmosphere. We are at about .74 C over baseline right now and getting hotter. The sulphur you talk about would cool the globe … in fact is that not what people are thinking about blowing into our upper atmosphere to provide a heat shield for the planet? Indeed, many people are very concerned over this issue because physics is physics. It does not matter what anyone cares, believes or wants to happen. We are committed to a much hotter world in the near future and we as a species and all the other species alive today have, like us, no experience with these kinds of changes. Increased CO2 causes plants to uptake fixed nitrogen faster which reduces the fixed nitrogen in the soil. After certain concentrations are reached, on a per species basis, production falls off. Add to this problem the one of heating and drying of our 'breadbaskets' and we will be faced with food underproduction problems. Of course, we can use man made nitrogen fertilizer made from …. you guessed it …. natural gas. Heating, drying, CO2 pollution and flooding …. its a deadly mix for a population that will be running out of resources over the next 100 years and be 30% larger than today. Looks like to me our species is in for a 'spanking'. Duncan Davidson — Good article! Thank you. The Bitcoin Debate: Future of Money or Speculative Hype?